At Rawlins Paints, we recognise the importance of selecting the right kind of metal paint to make sure you get the finish you need on both exterior and interior surfaces. 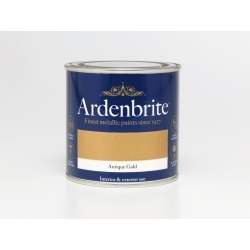 The nature of the environment and material will dictate the type of metal topcoat, aluminium paint, chlorinated rubber or enamel paint you’re looking for, and we’re confident that our wide range of metal topcoat finishes will cover everything for your project, no matter how large or small. Different substrates provide all sorts of challenges for metal primer paint and metal topcoats, including rust, flaking, surface bubbling and the possibility of a poor finish. Important considerations are: how flexible is the application? Is it easy to use? What kind of finish does the metal topcoat give? How decorative is the result? 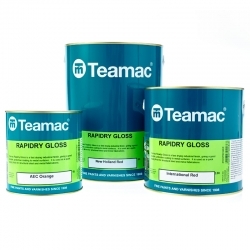 A tough, flexible enamel paint with an attractive gloss finish and excellent durability. It has good resistance to lubricating, mineral oils, many common industrial chemicals and heat. 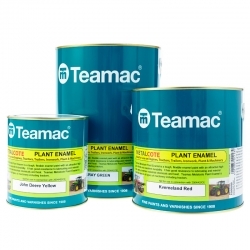 A fast drying industrial gloss finish, giving a good durable, protective coating to metal surfaces primed with Teamac Rapidry High Build Zinc Phosphate Primer or similar.